Your dog adds so much to your life, and you want to feed him a healthy food, but with all of the choices out there, how do you know which food is best? First of all, keep in mind that there is no one food that is best for every dog. There is no single food that will give every dog the brightest eyes, the shiniest coat, the most energy, and the best digestion. Dogs are individuals just like people, which means that you could feed a brand of very well-formulated food to a group of dogs and find that most of them do great on it, some not as well, and it may actually cause some gastrointestinal upset in a few dogs. Luckily, there are many well-formulated dog foods to choose from today, and it is fine to try several to determine which one works best for your dog. Make sure that the food you choose is appropriate for your dog's stage of life. A puppy eating an adult food will not get the higher amounts of calories, protein, vitamins, and minerals he needs for proper growth. An adult dog eating puppy food is likely to become overweight. An older dog may need a senior food that is more easily digested. When it comes to nutrition, one size does not fit all. People often wonder if they should feed dry food, semi-moist or canned. The answer is that it depends on the individual animal, although dry food is recommended most often. To find out how the different types of food are made, see Types of Dog Food: the Basics. High-quality ingredients are essential for a healthy food. Some economy brands of dog food are made from inexpensive ingredients that are not easily digested, and therefore, do not provide the best nutrition. 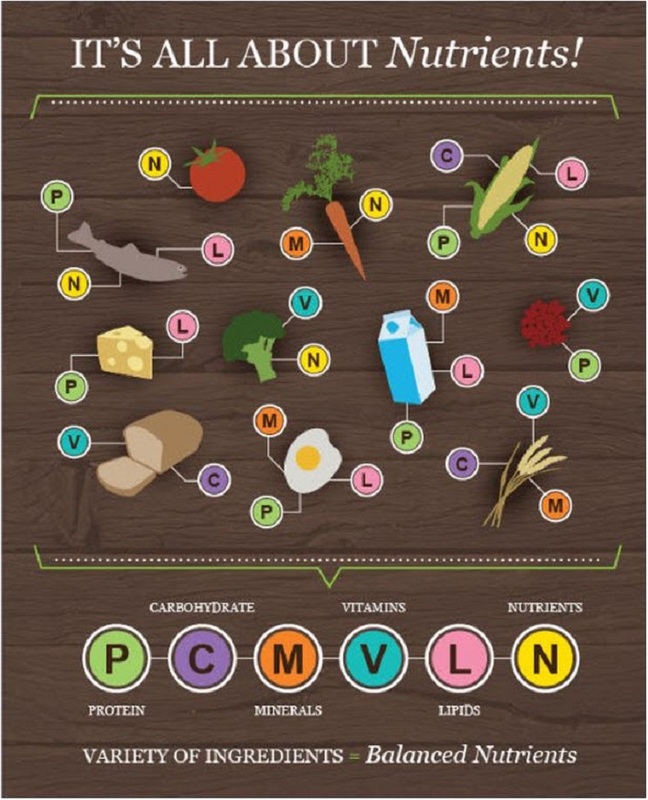 While they may technically meet the legal specifications for percentages of protein, fat, carbohydrates, etc., these foods have lower energy values and lower-grade proteins. Because of this, many health-building nutrients may pass right through your dog's system without being absorbed. It also means that you have to feed larger amounts of that lower quality food to provide your pet with the same nutrition as a smaller amount of premium food. When you compare the cost of these foods on a per-serving basis, and realize how quickly you go through a bag, economy foods may actually cost more in the long run. When you are looking for a healthy food for your dog, reviewing the list of ingredients on the back of the bag is a good place to start. By law, pet food labels must list their ingredients by weight. Look for meat, fish, egg, or some type of meat meal or fish meal as the first or second ingredient. Meat, fish, and eggs all have a high biological value, which means they have a high percentage of protein in the form of digestible, usable amino acids. The next thing to look at is the Guaranteed Analysis on the back of the bag. It is a chart that lists the percentages of various ingredients contained in that food. However, the numbers given in the Guaranteed Analysis are on an "as fed" basis and do not take into account the amount of moisture in that food. All pet foods have different levels of moisture; canned foods can have up to 80%, and dry foods can have as little as 6%. 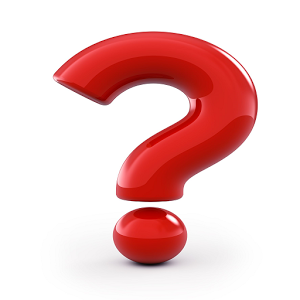 To determine the actual amount of an ingredient in a food, or to compare between brands or between wet and dry foods, the numbers need to be converted to what is called Dry Matter (DM) basis. 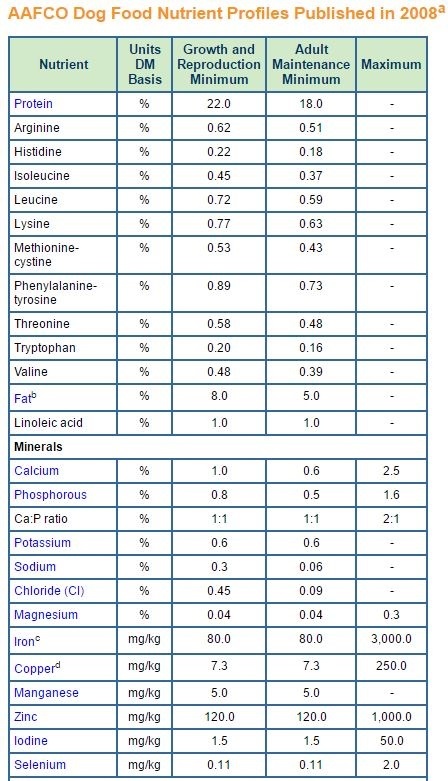 To evaluate a particular dog food, compare the DM ingredient amounts to a nutrition chart such as the Association of American Feed Control Officials (AAFCO) Dog Food Nutrient Profiles (see below). Dog foods labeled as 'complete and balanced' must meet standards established by AAFCO, either by meeting a nutrient profile or by passing a feeding trial. Dog foods labeled as 'complete and balanced' must meet standards established by the Association of American Feed Control Officials (AAFCO) either by meeting a nutrient profile or by passing a feeding trial. In 1995, the AAFCO's Canine Nutrition Expert Subcommittee revised their Dog Food Nutrient Profiles. There are now two separate nutrient profiles for dogs - one for growth (puppies) and one for adult maintenance. Maximum levels of intake of some nutrients have been established for the first time because of concern that overnutrition, rather than undernutrition, is a bigger problem with many pet foods today. The standards include recommendations on protein, fat, fat soluble vitamins, water soluble vitamins, and mineral content of foods. 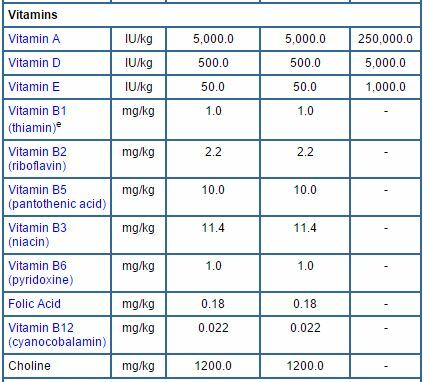 The levels of nutrients in the table below are expressed on a 'dry matter' (DM) basis. On most pet food labels, the levels listed in the guaranteed analysis are expressed on an 'as fed' basis. To convert 'as fed' to 'dry matter' a simple conversion is necessary. If a dry food has 10% moisture we know that it has 90% dry matter. So we look at the label and check the protein level. That reads 20%. Next, we divide the 20 percent protein by the 90% dry matter and we get 22%, which is the amount of protein on a dry matter basis. Does this make sense so far? Good. Now let us compare this to canned food that has 80% moisture. We know that with 80% moisture we have 20% dry matter. The label shows 5% protein. 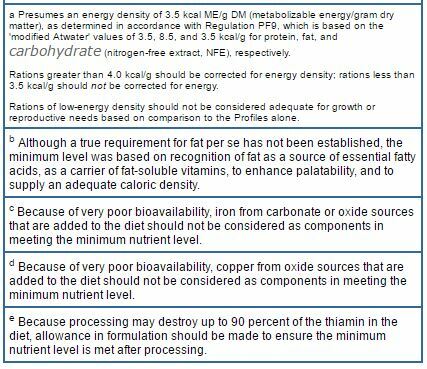 So we take the 5% and divide it by 20% and we get 25% protein on a dry matter basis. So the canned food has more protein per pound on a dry matter basis after all the water is taken out. We can do the same for fat, fiber, etc. When you have done some comparison and picked out a well-formulated food, make sure you allow ample time for your dog to make the transition from his current food to the new one. Normal bacteria in the intestine help your dog digest food. A sudden change in food can lead to changes in the number and type of these bacteria, making it harder for food to be digested, and resulting in intestinal upset. To avoid problems, switch to a new food slowly, over the course of at least 7-10 days. Start by mixing 25% new and 75% old food, and feed that for at least 3 days. If all goes well, go to 50% of each type of food for 3 days, then 75% new and 25% old for 3 days. By now, your pet should be ready to eat only the new food. If problems occur, consult your veterinarian for advice. After you have done all you can to make sure a food is nutritionally sound, take a look at your dog after he has been on the new food for at least a month. Bright eyes, a shiny coat, good body condition (not too thin or overweight), and good energy will let you know you are doing a good job with your pet's nutrition.